Over 350 people attended a Town Hall Meeting October 22 in New Melle to discuss getting shoulders and other road safety topics concerning Hwys. D, DD, F and 94 in southwestern St. Charles County. The meeting was organized by Shoulders fOr Safety (S.O.S. 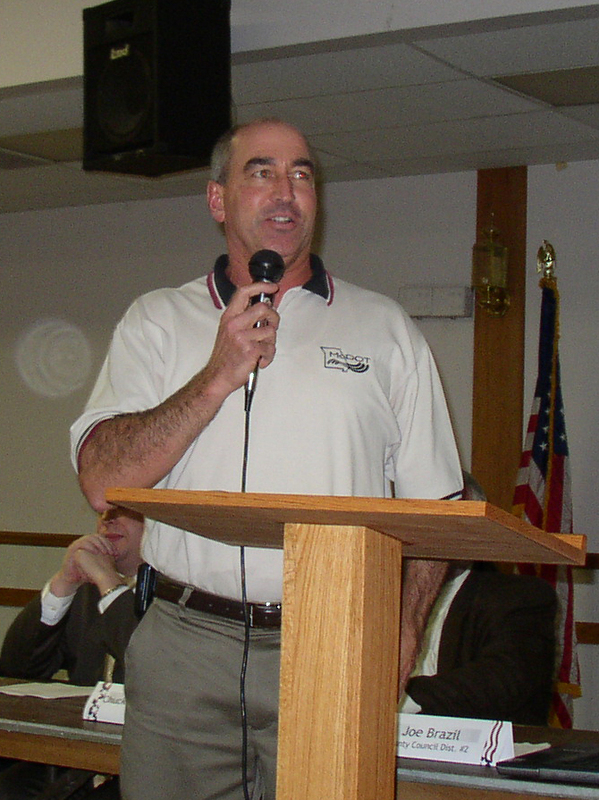 ), a grass roots group of concerned citizens, and hosted by Joe Brazil, St. Charles County Councilman for District 2. Panel guests included: Jim Gremaud-MoDOT District Engineer; Missouri Senator Scott Rupp; St. Charles County Sheriff Tom Neer; State Representative Scott Dieckhaus; State Representative Chuck Gatschenberger; Sgt. Al Northum; Sgt. Stephen Ferrier and Lt. Elvin Seals of the Missouri State Hwy. Patrol; and Bill Schoonover, Drivers Education teacher from the Wentzville school district. Also attending in the audience was Ed Hassinger, St. Louis Area District Engineer for MoDOT. 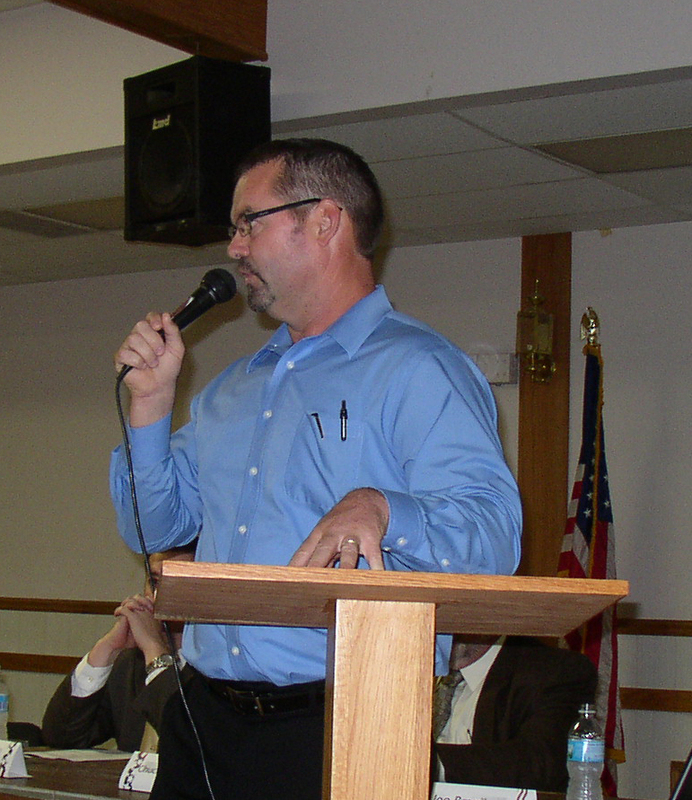 Agenda items included a public hearing on reducing the speed limit on a portion of Hwy. DD; repealing Senate Bill 322 which increased the commercial weight limits for trucks; getting shoulders on Hwys. D, DD, F and 94; driver education efforts; and a question and answer period. The public hearing dealt specifically with a proposal to reduce the speed limit from 50 mph to 40 mph on Hwy. DD from Hwy. 40 to 500 feet west of Frontier Middle School near Sommers Road. Comments regarding the speed limit decrease were mixed. Brad Temme, Senior Highway Designer with MoDOT said the standard recommendation for a road with no shoulders and an 11-foot lane would be 45 mph, but with the turn lanes that have been added in that area, he felt 50 mph is justified. Two other people agreed, citing that the road is drivable if drivers pay attention and aren’t distracted by cell phones, etc. At least three people spoke in favor of reducing the limit to 40 mph, largely due to traffic volumes and the lack of shoulders. Next on the agenda was a discussion urging the repeal of Senate bill 322 enacted June, 2007 which increased the weight limit for commercial vehicles from 18,000 lbs. per axle to 22,400 (2.2 ton increase.) 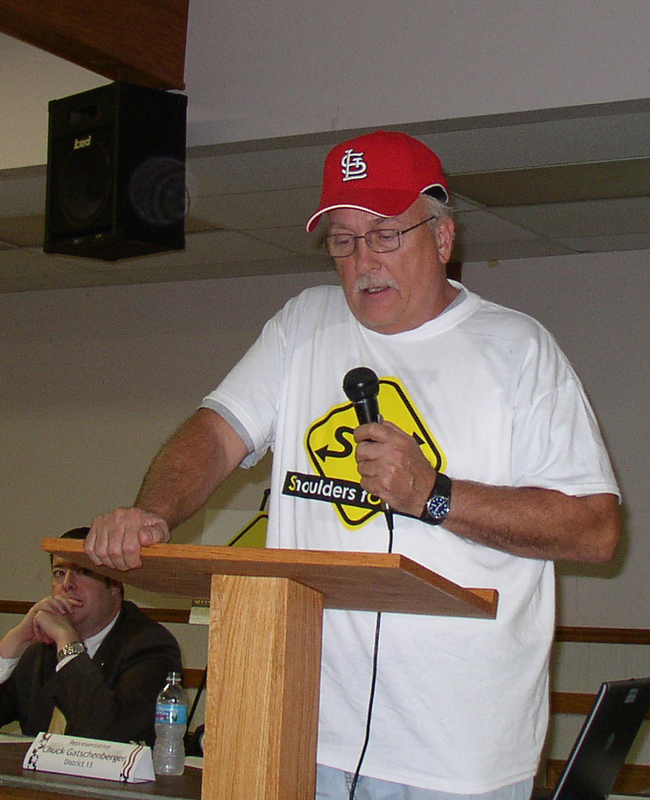 Joe Brazil said, “A typical dump truck with a pup trailer can now carry 11 more tons.” Brazil said at the time of passage, the measure was opposed by the Missouri Dump Truckers Association, St. Charles County Highway Engineer, the City of New Melle, the St. Charles County Council and the New Melle Fire Protection District and many private individuals. 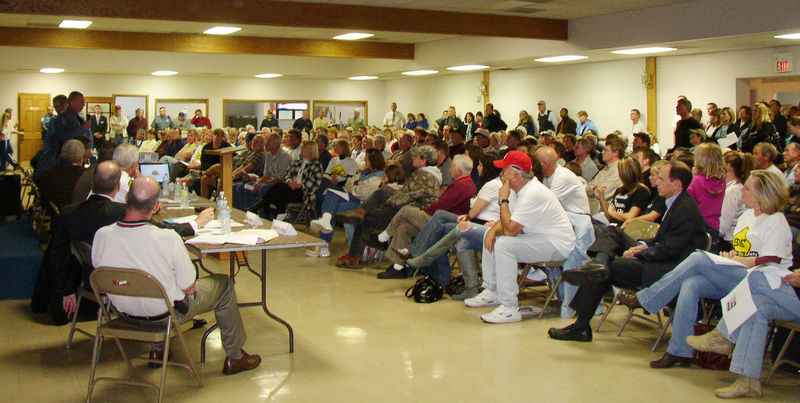 In 2008, St. Charles County Council passed a resolution requesting the bill be repealed. Brazil said roads are being destroyed, especially Hwy. F, from the heavier loads. He listed reasons to repeal the law: safety (narrow lanes, no shoulders), less tax revenue because of less fuel used, and more damage resulting in increased maintenance costs. He expects quarry traffic to increase in 2010 because there is $100M in road improvement projects scheduled in St. Charles County next year. Much of the rock for those projects will come from area quarries. On the topic of shoulders: Sherry Cybularz, spokesperson for S.O.S., thanked everyone for coming. She said, “They say there’s power in numbers, with all of us here we have a compelling case.” S.O.S. started with a handful of concerned moms and quickly became community wide effort to get shoulders on Hwys. D, DD, F, and 94. Cybularz said, “So far, in 2009, there have been 21 automobile fatalities in St. Charles County. Nine of those have occurred on these roads – that’s 43%! Shoulders have been proven to save lives, and shoulders are what’s needed…We can’t let anymore time go by because another life lost is one too many.” She said, “Two primary responsibilities of government are to provide safety for its citizens and to manage basic infrastructure such as roads and bridges. We all pay considerable property, income and gasoline taxes which need to be better allocated to these causes. The members of S.O.S. will vote for legislators who take our requests seriously.” Cybularz presented Senator Rupp with 2400 signatures collected in last 30 days and urged people to join the S.O.S. Facebook group to stay informed of the group’s progress. 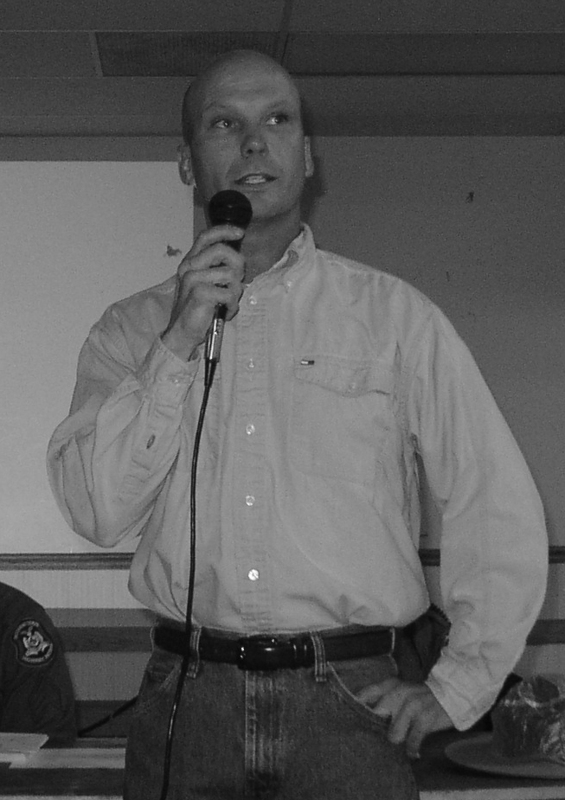 When Randy Frump addressed the crowd, he introduced himself as having the unfortunate distinction of being the first parent to lose a child on these roads in 2009. He said, “More unfortunate, I wasn’t the last.” Randy’s 26 year old son, Bryan, was killed on Hwy. D on New Year’s Day. He described the experience of looking out his window and seeing two Missouri State Hwy. Patrolmen pull to his house. “As soon as the officers emerged I knew why they were there,” He said. He mentioned two other young victims who died this year, 16-year-olds Brianna Carron and Elise Sunderhuse. “I cannot convey what it’s like to lose a child,” he told the crowd. “The pain is unspeakable. It’s numbing. It’s excruciating. The pain is not only experienced by the parents, but extends to the whole family: grandparents, brothers, sisters, cousins, aunts and uncles. Close friends as well are overwhelmed with grief.” Frump said, “My point is, each and every tragic loss of a life cut short affects so many people, in such a tragic way, we need to do whatever it takes to prevent this.” He asked the officials in attendance to please help. He understands part of the problem is a lack of money. He said at least road improvements have a finite dollar value. “The loss of a child is priceless, and the pain is endless,” he said. Joe Brazil said the estimated total population of St. Charles County is about 324,000. About 25,000 people live south of I-70 and west of I-64/Hwy. 40. “We have 8% of the population and 43% of the total fatalities so far in 2009. That’s staggering,” he said. According to MoDOT, some of the most common factors that contribute to crashes include inattention, following too close, driving too fast, failure to yield and improper lane use. Brazil asserted that the statistics were understated, citing unreported accidents, and other conditions that are not officially noted, including: narrow road ways, poor roadway conditions, deer population, quarry traffic, and added weekend traffic. He also discussed the need for better education of new drivers, encouraging better seatbelt usage, and discouraging cell phone use and texting while driving. Jim Gremaud, MoDOT Area Engineer for St. Charles County, agreed wholeheartedly that shoulders were needed and they were going to work to try to get them. The problem is funding. He said a project is already approved to add shoulders to Hwy. DD from Hwy. 40 to Frontier Middle School and that the schedule for that project will be moved up to late Spring 2010 with completion by year end. He said design work is complete for adding shoulders to Hwy. 94 from Hwy. 40 to Defiance, and they are beginning design work to add shoulders to Hwy. D from Hwy. 94 to New Melle, and to the rest of DD. “It’s just a matter of finding the funding,” he said. These shoulder projects would add a 4-foot shoulder to each side of the road, at an estimated cost of about $400,000 per mile. He estimated 90 miles of road along the routes being discussed, including Highways 94, D, DD and F. He said the 4-feet width is a practical compromise. It would significantly improve safety, but would not provide room to pull a car completely off the road. Comparatively, to put an 8-foot shoulder on both sides would mean only doing about 1/3 the distance. Senator Scott Rupp explained that funding for Missouri roads comes from the gasoline tax. High gas prices, better fuel efficiency, and the sluggish economy have decreased gallons used, and consequently, gas tax revenues. As revenues have decreased, construction costs for concrete, rebar and asphalt have increased dramatically, to the point that all MoDOT is currently able to do is maintain. As of 2010 there are no Federal funds for new construction in Missouri. He said some other source of funding must be found, possibly a 1-cent statewide sales tax proposal that will be put to the voters. Several residents later pointed out that a statewide increase wouldn’t necessarily translate into more funding for this local area. The problem is allocation. Rupp mentioned looking into a TDD (Tax Development District) which levies an additional sales tax in a specified geographic area that is then allocated to a specific road project in that same area. The cities of Wentzville and Moscow Mills both used TDDs to help fund construction of highway overpasses. Sheriff Tom Neer lives in Defiance and understands the situation. He encouraged drivers to slow down, pay attention and stay off the cell phones. He said speed enforcement is difficult because there aren’t many safe places for people to pull over – a concern that was echoed by state patrol officers in attendance. Bill Schoonover, Driver’s Education teacher for Wentzville School District said some school districts no longer offer the program, in others, it is an elective. Usually there is an extra cost to the students for actual driving lessons. Only about 30% of his students take the driving lessons, which include a session on rural roads and how to avoid overcorrecting. He said the Missouri Driver Education and Safety Association is working on proposals to collect a portion of traffic fines and a proposal for a $1-5 vehicle registration fee to help fund driver’s education. A number of people in the audience made comments or asked questions. Several stated that we all have to take personal responsibility for our driving: pay attention, avoid distractions and slow down. Others countered that even the most defensive drivers have nowhere to go to avoid deer or oncoming vehicles that cross the center line. Mike Cavanaugh, who suffered multiple injuries (all ribs, back and pelvis broken) after swerving to avoid an oncoming truck in 2006, urged the crowd to support some sort of tax increase if that’s what it takes to get the roads improved. Members of S.O.S. plan to keep pressure on elected officials in hopes of getting more funds allocated, and may hold more town hall meetings in the future. Residents are urged to join the S.O.S. Facebook group (accessible from www.shouldersforsafety.org), or call 636-798-2041 for more information. If you have a testimonial that can be included in future public handouts, please email SOS at shouldersforsafety@yahoo.com. Residents are also encouraged to contact political representatives personally: Senator Scott Rupp, State Capitol Building, Rm 426, Jefferson City, MO 65101, scott.rupp@senate.state.mo.us, 573-751-1282; State Rep. Scott Dieckhaus, MO House of Representatives, 201 West Capitol Ave, Rm 405B, Jefferson City, MO 65101, 573-751-0538, scott.dieckhaus@house.mo.gov; or Rep. Chuck Gatschenberger, MO House of Representatives, 201 West Capitol Avenue, Rm 415B, Jefferson City, MO 65101, chuck.gatschenberger@house.mo.gov, 573-751-3572. S.O.S. is planning to attend future St. Charles County Council meetings. Anyone in support of their efforts is welcome to accompany them to those meetings. Scheduled upcoming council meetings are Nov. 9 and 30, and Dec. 7 and 22.